Sydney is located on land traditionally owned by the Gadigal people of the Eora Nation. Gadigal people were involved in the planning and hosting of the 5th International Indigenous Pre-Conference on HIV/AIDS , held from July 17 to 19, along with great help from the Australian Aboriginal and Torres Strait Islander Organising Committee (AATSIOC). The theme of the pre-conference – Our Time, Our Story, Our Future – focused on making the world sit up and notice Indigenous Peoples’ successes standing up to the challenge of HIV and Hep C.
This year almost half of the delegates at our pre-conference were non-Aboriginal friends. Not only did we exchange our knowledge and experience working in HIV and Hep C, but we had a great time sharing our culture and our colours with each other. New friendships were forged and old friendships strengthened. My Indigenous peers living with HIV and/or Hep C said they really enjoyed the talking circles, particularly the one for HIV+ Indigenous people. There were also talking circles for Indigenous youth, trans people, women and girls, people who inject drugs and gay men and MSM. But it was also an opportunity for action. The AATSIOC launched the Eora Action Plan, seeking to bring greater attention and efforts to HIV prevention and treatment for Aboriginal and Torres Strait Islander Peoples. The pre-conference ended with a panel of Elders talking about their experience learning about and working with HIV over the years. It was a great three days of intense analytical learning and thinking, strong emotions, spiritual enlightenment and psychosocial reflection. 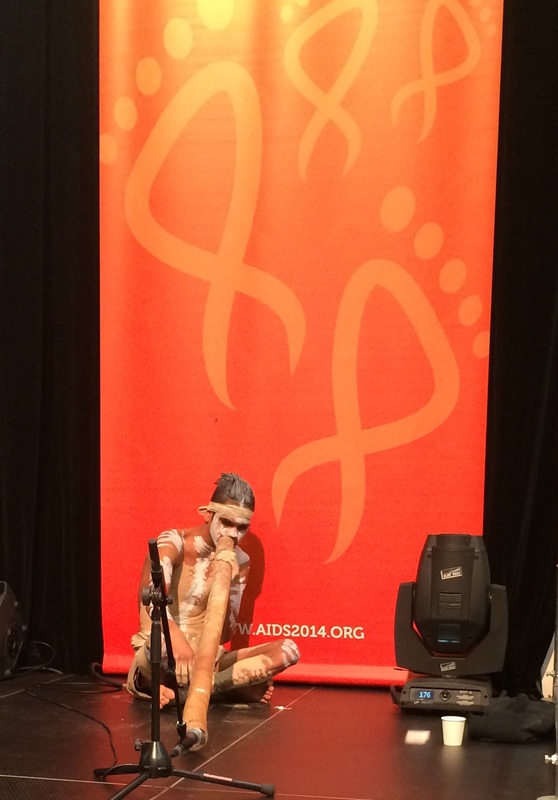 The main AIDS Conference included an Indigenous plenary session, workshops, posters and plenty of Indigenous content on the Global Village main stage. The Indigenous Peoples’ Networking Zone was a smash success thanks to the work of Victoria Aboriginal Community Controlled Health Organization in Melbourne and the AATSIOC. Trevor Stratton is a member of the CATIE Board of Directors, Chair of CATIE’s Aboriginal Advisory Committee,and Coordinator of the International Indigenous Working Group on HIV & AIDS, which organized this year’s Indigenous pre-conference at AIDS 2014.